Abosaide Cadogan is backed into a corner by two opposing Kazakhstan players during the Guyanese 2-1 win in their opening group match. thrilling win over Kazakhstan women who are ranked 13th in the world, at the University of Toronto’s Athletic Centre. The Guyanese team that are ranked 31st was quoted as being the youngest put together squad in years by their head coach, Philip Fernandes. In the win, Trisha Woodroffe scored both of Guyana’s goals during a good 2-1 victory, a big feat for the largely developmental team that is the poorest ranked side in the series. 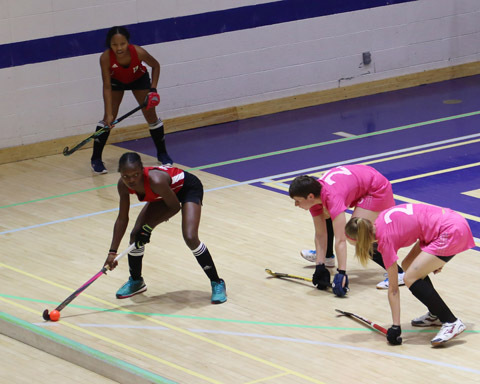 In Guyana’s second group game on Friday, they lost to Canada Red (Canada A team) 6-0 but a 0-0 draw against Canada White on yesterday, ensured that the local team qualified for the knockout stage. In an invited comment with Kaieteur Sport, Coach Fernandes expressed pleasure with the ladies for their spirited performances and he explained that reaching the semifinals of the tournament is already exceeding his pre-tournament objectives. He predicted that in a couple years, Guyana’s female team will be a formidable side. Up to press time, the result of the Guyana’s semifinal match was available.